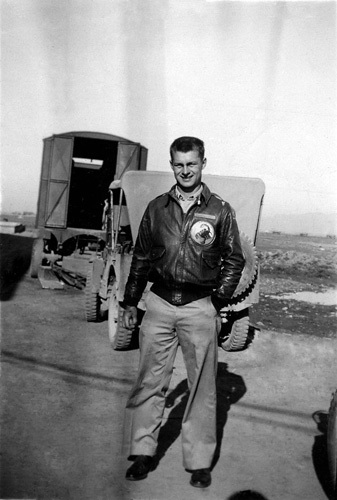 64th FS Pilot Robert N. Nielsen Jr.
After initially transitioning to P47s in Baton Rogue, Louisiana they were transferred to Pocatello, Idaho. Dad and two other pilots arrived on schedule and were greeted by the Mayor and Council members. This photo was taken by the local newspaper as their arrival was big news in Pocatello. The rest of the planes had been delayed enroute because of weather. Which for some reason they managed to miss. What I found amazing about this photo was the apparent condition of these airplanes. They appeared to be "well used". 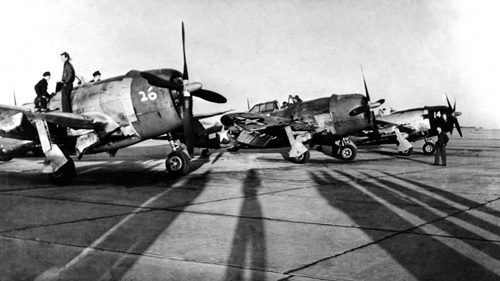 Dad confirmed this and said when he finally got to Italy and joined the 64th Fighter Squadron the condition of the airplanes he flew improved greatly. Dad was in seventh heaven here in Pocatello. One of the things he loved to do ever since he was a boy was to hunt birds. During some of their free time he and a couple of others would go down to the Snake River canyon with their shotguns to hunt ducks. They would sit in the bottom of the gorge and wait until the ducks flew over head, heading upstream before shooting them. That way all they needed to do was to wait for the river to carry the ducks back down to them. This made for a very easy retrieval system with little effort needed other than to scoop them out of the water as they floated by. Another picture of my father, Robert Nielsen, Jr. 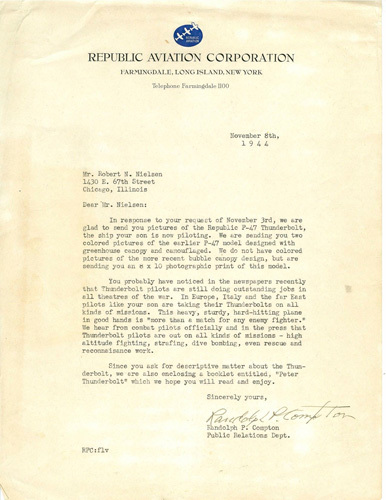 This is a copy of Republic Aviation's response to a request my grandfather had made for some pictures of a P-47. I certainly wished I could find these, but to date the search has yielded nothing. 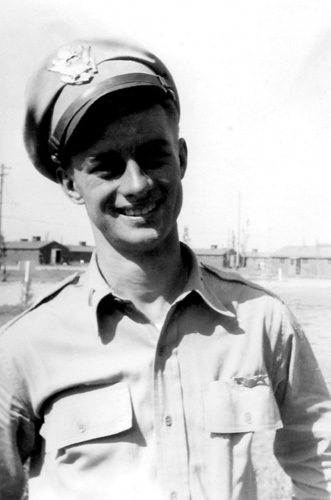 Picture of my father after joining the 64th Fighter Squadron. 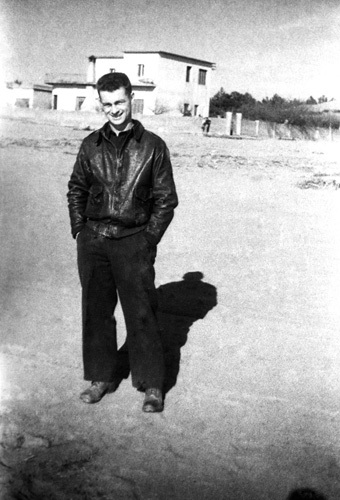 I am guessing this was taken shortly after he arrived in Italy in December 1944 since the A-2 leather jacket appears to be new. This is the same jacket that 40 years later caused the only disagreement between him and my mother. By that point in time this cherished jacket of his was beginning to look its age – and that is probably significantly understated. My mother could not stand it any longer so she put it in the trash. Dad got upset when he found this out, but fortunately was able to recover it before it was gone. Mom did convince him to retire that jacket and buy a new reproduction, although he kept the old one too! 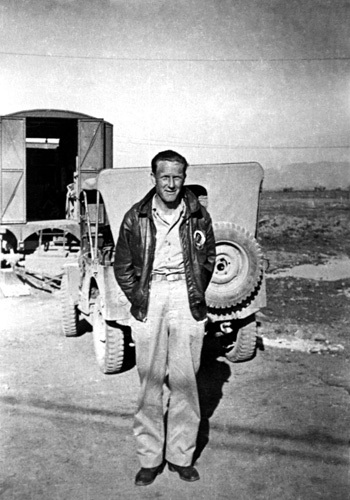 A picture of Dad in his flight gear just before a mission. I think this is one of my most favorite aviation pictures of my father. Dad said it was bad luck to have your picture taken just before a mission. This was the mission where the plane he was flying had taken a flak hit that caused a fire in the supercharger ducting. My father had about 100 pictures of aviator friends of his hanging in his office at work. This picture was beside two others. 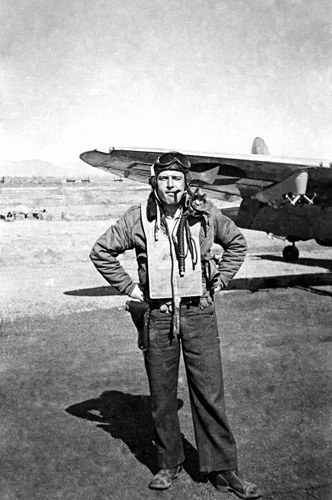 One was of his cousin, Navy Commander Jack Keller, and the other of his friend Jack Leaper. 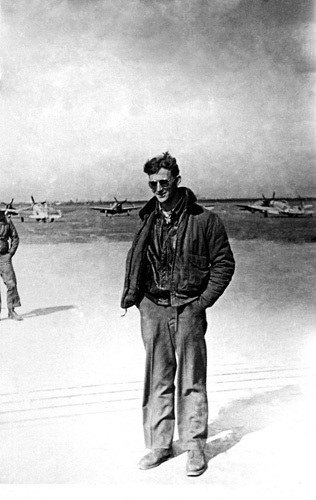 Both were shot down on missions immediately after those pictures were taken. 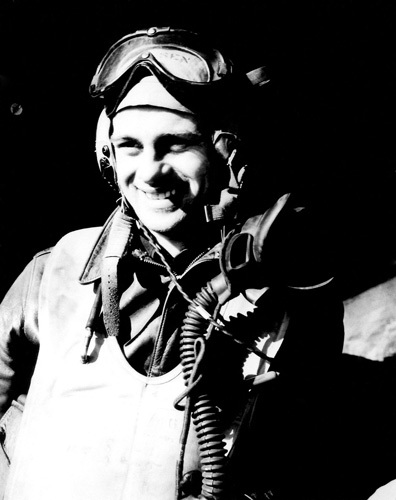 Jack Leaper was shot down during WWII while flying Marine Corsair in the South Pacific and was picked up out of the water by a Navy air-sea rescue team. Jack Keller was not as lucky. He was shot down while flying an EA-6 Intruder over North Vietnam. He was listed as a MIA for a number of years and eventually changed to KIA.